We recently released some news about our new upcoming version of BillingServ, V2. We promised that we would start blogging more about some of the exciting features that are being released in V2. One of our new features being released in BillingServ V2 is https://pymtpro.com/, our very own cryptocurrency payment gateway. With the feedback we received from our users, we thought it was best to build our own payment gateway, instead of having to maintain our current integrations. You can accept Bitcoin, Ion and Litecoin to begin with. We are expanding the coin list while we launch V2. PYMTPro has some fantastic processing fees, the gateway will only take 0.75% + transfer fee of any transaction. PYMTPro has been fully integrated into BillingServ V2 which will allow you to setup products/services and or send invoices and receive full payment via one of our supported cryptocurrencies. We designed PYMTPro to be fully compatible with BillingServ V2, all you need to do is to sign up at https://pymtpro.com/ retrieve your API keys and add them into your BillingServ Account. That’s it quick, simple and hassle free. Worried about the Bitcoin processing time? Don’t be as our system is designed to update your invoice once the Bitcoin has hit your PYMTPro wallet. Your clients can even see it processing in real time. That’s just one of the few awesome features that are being released in V2. Keep checking this blog and our social media to be kept up to date on all things BillingServ V2. BillingServ version 2.0 is coming! When development on Version 2.0 of BillingServ began, we set ourselves some very ambitious goals. We set out to completely rewrite BillingServ to make it even easier to use and decided this was the route to take, instead of just building on our existing platform. That’s why BillingServ V2.0 is a completely different product, we don’t want to just focus on the Web Hosting and Development side of things anymore. Any sized company in any sector can now truly use our platform for selling or invoicing. BillingServ V2.0 is our biggest change yet; its a huge deal for us and we’re confident you’ll love the results. We’ve been hard at work over the last 6 months building V2.0 – with considerable investment in new code and technologies allowing us to grow and expand easier. We set out to provide a better product which will improve the business users experience. I just wanted to highlight a few features that we are most proud off. We completely rebuilt the admin area and frontend, BillingServ is now completely mobile friendly. No need to download iPhone/Android Apps, just login via your mobile/tablet browser and get to work. We created the admin area to be fully responsive so you can continue running your business whether it be in an office, on a train or even a boat! BillingServ can now be used absolutely anywhere. Next on the list for us was to bring BillingServ up to PHP7, all of our backend servers are now running PHP7. This allows us to provide a much more secure and noticeably faster billing platform. We even completely rebuilt our cloud servers for BillingServ V2.0 offering a much faster and securer service. Last but not least, we built BillingServ V2.0 from the ground up to allow for faster coding, which means we will now be able to push out new features and fixes much quicker. If you would like to see new features being added to BillingServ please login to your account and click the blue icon on the right side of the page. This will help us to see what you would like to be included in BillingServ V2.0. BillingServ V2.0 is not far away now. In the coming weeks, we’ll be posting about what is being released in V2.0. Keep an eye out on our blog and social media to be kept updated. If you aren’t subscribed to our newsletter then please sign up. Accept ION and Bitcoin Via BillingServ! Here at BillingServ we are glad to announce that we have been working hard to bring BillingServ 2.0 which will allow you to accept payments via ION and Bitcoin (More will be added during the rest of the year). With BillingServ 2.0 you can now create invoices, sell products and services. We built V2.0 to allow any sized business in any sector to quickly get up and running, saving time to do what matters most, running your business. BillingServ V2.0 will be releasing within the next few weeks. We are currently in beta phase and working to our release date. We are giving a 10% Discount off the current prices. If you would like to receive this discount please use BSV1 and you will receive 10% off. BillingServ is an Online Billing Platform providing any business with increased ease of billing, cut costs and increase stability as BillingServ is hosted in the cloud. BillingServ software enables hosts, Telco’s and other businesses to sell their complete range of services through online invoicing for web hosting, VPS, domain names, ssl certificates and more. BillingServ launched February in 2014. Today more than 500 businesses in 65 countries use BillingServ as an online billing platform. BillingServ has 25 staff across the EU, US and Asia with its headquarters located in the UK. What’s coming up in our new V2.1 release! 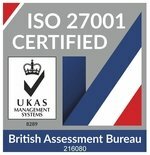 ISO 27001, BillingServ V2 & New Updates. What’s going on at BillingServ?